Red Thread Adventures: Siberia Calls! Itchy feet is a chronic condition in my family, and I'm not talking about the athlete's kind. We are in varying degrees a band of wanderers, seekers of adventure with a commonly held curiosity about the world and other people (some would simply call us nosey). My particular strain of this affliction was passed on to me by my grandmother. From when I was about the age of eight we would sit together on the sofa and she would show me photos and tell me stories of her travels to South America and the Far East, all the while inspiring my wanderlust. 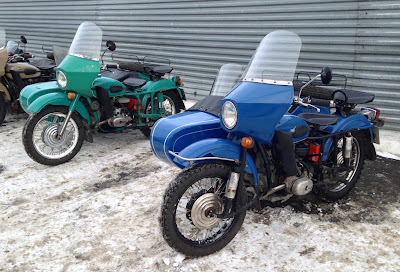 Whether she would have approved of the idea of driving a 30-year-old Soviet motorcycle from bumf**k nowhere in central Russia 1,800 kilometers northwards to bumf**k nowhere on the Arctic Circle, is impossible to know. But I think she would have appreciated the spirit of the idea. The Institute of Adventure Research came up with the idea of taking a classic Ural motorcycle and sidecar from Irbit to Salekhard along the zimniks, or ice roads, a couple of years ago. As soon as I heard about the trip I knew immediately I wanted to go on it. My colleague Brendan asked me the other day how many people were planning on going on this journey with me, and I said I thought about 20. To which he replied, "That's probably the entire global population that would have any interest in doing it." I think he’s probably right. Who is the typical Ice Runner? Well, as you might expect, the group is 90% male, early 30’s on average and damned good looking. A little unexpectedly, 60% of them are Australian, with a large contingent from Perth. Quite why these young men want to leave God’s own paradise at the height of summer and test their mettle in the maw of Russia’s winter it not completely clear. I asked several of them and they said simply, “…to have a go, eh?” Isn’t that what life’s about? Having a go? My grandmother thought so. So do I.